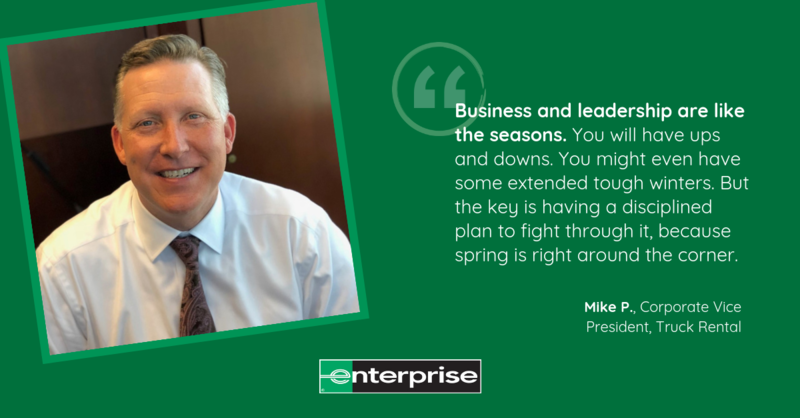 Twenty-six years after joining Enterprise as a Management Trainee in Southern California and a successful run with Enterprise Fleet Management, Mike P. was promoted to Corporate Vice President of Truck Rental. We found out what has him most excited about this new opportunity, what advice he would give new managers and – just as importantly – what acclaimed TV drama ‘appeared’ in. What excites you about this opportunity in Truck Rental? What are you looking forward to in your new role? I love the fact that after 26 years with this amazing company I have the privilege to learn and grow personally and professionally each day! In my new role, I look forward to providing vision, guidance and governance to help operating groups reach and surpass their ambitious goals. We must continue to stay hungry and vigilant with balanced excellence in operating and selling. We’ve had incredible years of sustained success, but we must avoid getting complacent. What are your thoughts on leadership? What advice do you have for new managers? Keep learning by managing up and asking for help. If you are lost, you have no problem asking Siri for directions. Why not approach your career in the same way? Don’t be afraid to model other leaders’ behaviors and qualities. Business and leadership are like the seasons. You will have ups and downs. You might even have some extended tough winters. But the key is having a disciplined plan to fight through it, because spring is right around the corner. Have fun and be yourself. Don’t allow a promotion to change your personality and behavior. Trust others and try to earn your team’s trust every day. You will not be perfect and that is okay. What is your Enterprise career path? I started in Southern California as a Management Trainee and worked my way up to Branch Manager. While at my branch in San Diego I learned about Enterprise Fleet Management and made a career switch to an Account Executive for EFM, eventually working my way up the coast as Director of Fleet Management in Sacramento. From there I took a corporate position in St. Louis supporting the North Central team where I spent 12 years. Earlier this year I earned the opportunity of my career as Corporate Vice President of Truck Rental. My real passion is heavy metal music and playing guitar. I have been in many bands and one of my songs even made it in the background of the show Homeland!